veins. However far he ranged, however blistering or abstract his playing, there was always, at least up to a certain point, a sense of song there. One of my favorite musicians. I believe I only saw him perform three times. The first was at the old Kitchen, on Wooster and Grand, I guess around '76, in a loose knit band with his wife Moki on tambura (I think) and two or three others I can't quite remember, possibly Frank Lowe among them. Maybe Badal Roy? In fact, if you're still reading here Mark Forman, I think this concert was where we first met, which would place it around October of '76. 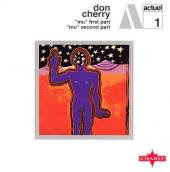 Saw Cherry with Ornette in the summer of '77 at Avery Fisher Hall in Lincoln Center, an amazing "double bill" with the Cherry/Redman/Haden/Blackwell quintet first, then Prime Time. The last time was not so pleasant, a quartet date at a short-lived club on Houston St. called "Spiral", sometime in the mid 80s. Cherry was apparently in the midst of one of his bouts with heroin and was spaced out to the extreme, seemingly having little idea where he was, what was going on. Bob Stewart was with him on tuba (and was spectacular). There was a guitarist (I don't remember who) and a last-minute, young drummer who was clueless. 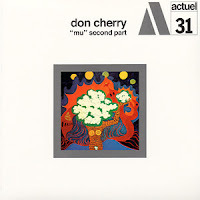 Playing through my Cherry vinyl, I begin with the two Mu sessions, two of the few original Actuel LPs I own (I have earlier Cherry, but on on disc). They still stand out for a kind of rawness, a real in-your-face recording quality that's very bracing. Great playing, of course (Blackwell, with Roach, still my favorite jazz drummer), wonderfully wide-ranging. I'm pretty sure these discs were my first exposure to the compositions of Dollar Brand. 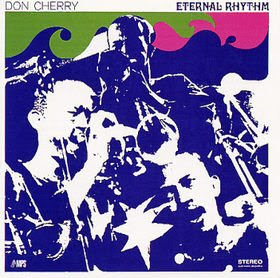 "Eternal Rhythm" remains my favorite recording under Cherry's name and, imho, one of the finest jazz records of the 60s. Wild, absurdly far-reaching from gamelan to the blues, awesome work by Sharrock and Karl Berger, an olio that has no business working but does so beautifully. 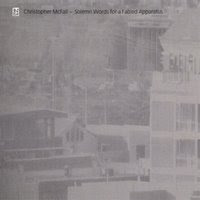 More thoughts in my AllMusic write up here. 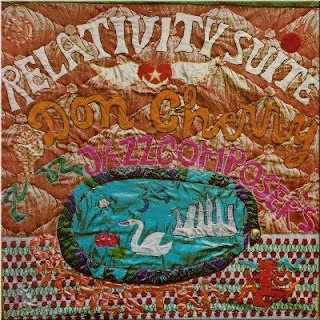 Side One of "Relativity Suite" is just about as good, a gorgeous mini-suite that features some tremendous Cherry vocals (he's really one of my fave vocalists in jazz) and the sublime "Desireless", surely one of the loveliest melodies in the music. That wonderful rhythm in the 2nd section...The second side's more of a mixed bag but not bad at all, nice Bley piano and rousing Blackwell to finish up. Is this still not available on disc? iirc, Joe McPhee participated in rehearsals for this but couldn't make the recording date, a shame. 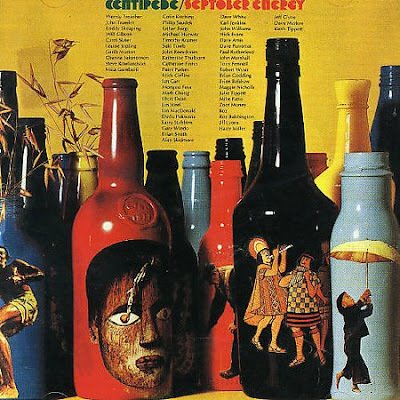 I have "Orient" as a double LP on Affinity (can't locate an image--currently available on disc with a cover showing an ant walking around a yellow fruit or lemon drop) though I think it's shown up in various guises. The first disc is a trio date from 1972 with Han Bennink and Moki Cherry. They begin with a version of "Desireless" then go out from there, a bit ragged but much fun. It's kind of a mess but Cherry was responsible for some glorious messes and that musicality and engaging spirit almost always carries the day. The other disc is from a concert with Okay Tamiz and the great Johnny Dyani. Should have been more Cherry/Dyani collaborations, two supremely musical fellows. 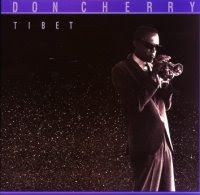 I think the album I have titled "Tibet" (on Picc-a-dilly) has also been issued elsewhere under different names--currently available combined with "Eternal Now"--recorded around '74, I think with Don Cherry (piano, percussion); Christer Bothen (piano); Bernt Rosengren (taragot); Agneta Ernstrom (tibetan bell, etc); Bengt Berger (piano, mridangam, etc). 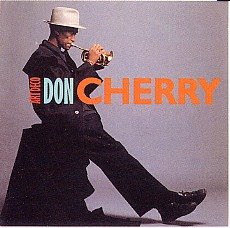 Good record, Cherry venturing out into areas even further removed from jazz, not playing trumpet at all, despite the cover photo. "Bass Figure for Ballatune" is a pretty amazing piece for pounded piano a la an especially vociferous Terry Riley. Mighty big jump, chronologically as well as stylistically, to the next and final Cherry vinyl in the house, 1988's "Art Deco". Pretty widely heralded at the time for dopey reasons--Cherry coming back to the mainstream, showing those young lions a thing or two. It's smooth, accomplished and more than a bit bland. Nice quartet with James Clay on tenor, Haden and Higgins, Cherry's trumpet work is quite pure though lacking the passion of his best playing. Overall, I found the effort disappointing though I imagine, or hope, that the deal with A&M got him a bit of money. 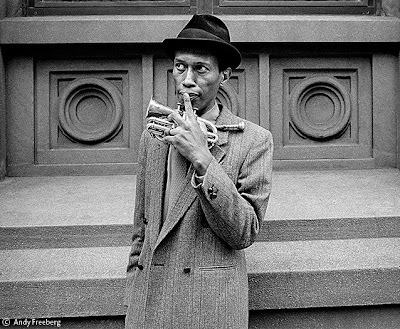 Some of his subsequent discs, particularly "Home Boy" & much of "Multikulti" were dreadful. But overall a unique and wonderful musician. In peak form, probably no one I'd rather hear on trumpet. Thanks, Mr. Cherry. 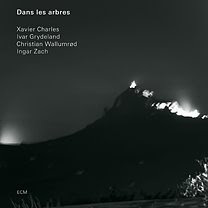 Ingar Zach was kind enough to send me copy of the new ECM release, Dans les Arbres, on which he plays with Xavier Charles (clarinet), Ivar Grydeland (prepared banjo) and Christian Wallumrod (piano). A digression into my ECM history--I was a pretty early fan, coming into the label shortly after it was launched, mostly due to its presence in the New Music Distribution Service catalog in the early 70s. Maybe the first thing I picked up was the Music Improvisation Company album, entirely because of Jamie Muir's being there (I was still listening to Crimson at the time), giving me my first taste of Bailey and Evan Parker circa 1973 or '74. Was pretty well hooked for a few years thereafter, including (gulp) the first Jarrett solo albums (I still like "Facing You", dammit), early Garbarek, etc. I place the initial appearance of what would become known as "the ECM sound" (more an approach than a sound, maybe) with something like Garbarek's "Dansere" or Eberhard Weber's miserably titled, "The Colours of Chloe". It was apparent in the late 70s, somewhat assuaged by the adoption of the Art Ensemble, Reich, etc. But by and by, I began ignoring the label as such, making the occasional purchase when an individual release warranted it. Over the last five or so years, I don't imagine I've bough more than two or three. 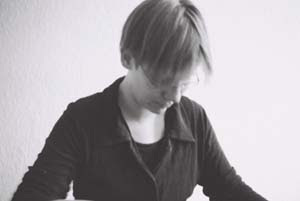 I think the last may have been Marilyn Crispell's take on Annette Peacock (partially successful, imho). Anyway, aside from an interest in what Charles has been up to and usually enjoying Ingar's work, I was curious if the ECM aesthetic was still in force, still tending to dominate a recording. Well, yes and no. "Dans les Arbres" is a pleasant enough album, at a couple of points (the two longest tracks) emerging into the richly enjoyable. It's moody (the track titles, if my French serves me well, allude to various aspects of ennui), the textures have a watercolor-ish air even as they refer to Cage's prepared piano works. But there is a slight scrim over the music, a bit of the ol' gauze the label's known for. Maybe I'm bringing in past prejudices, but I did want to hear a sharper projection, a little more of the rough and tumble that surfaces briefly when Charles gets combative. A good record and I'm guessing a damn sight better than much that ECM issues these days, but I'd be curious to hear the same quartet on a different label. An LP on Simple Geometry from Tetuzi Akiyama and Jeffrey Allport, containing two sidelong improvisations. Widely spaced guitar twangs and other sounds (the latter from Allport, I assume), with abundant ambient noise. Nice and relaxed, very casual. Not gripping, especially, but then, I doubt it's intended to be. Totally fine to leave on in the background and let blend with your neighborhood. I've never been the biggest fan of Chadbourne (as a musician--I really enjoy his reviews on All Music, think they're among the best at that site). I remember seeing him at Environ around 1977, I think with Zorn, Polly Bradfield and a few others, maybe David Moss. He had his rake out. But in the early 80s, I picked up a few records, enjoying some aspects, not others. He's one of a sizable number of musicians who I'd prefer hearing perform straight than out, in Chadbourne's case tending to mean doing covers of folk and country favorites. His political rantings, well-intentioned though they may be, tend to be painfully shallow, obvious and naive, especially when set against, say, a Phil Ochs song. He's more Roger Miller than Ochs. Plus the fact that he's a dead ringer for the primordial grandmother. The lo-tech approach was pretty cool then and still has its charms--abrupt edits, crappy sound, etc. 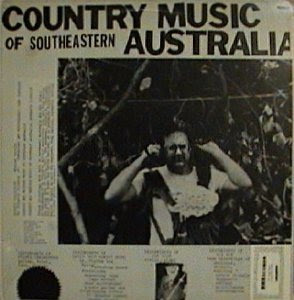 "Country Music from Southeastern Australia" is the out-est of this bunch, humorously packaged as an ethnic field recording and vacillating between C&W wannabee songs and random noise. David Moss, Rik Rue and Jon Rose accompany. It's kinda fun; I could imagine hanging out in some seedy barroom, enjoying these guys farting about, chuckling at the lowbrow humor, immediately forgetting it on the way home. "Country Protest" (surprised there's not a larger image around) is slicker, Chadbourne employing some traditional players, and it works reasonably well. This is from 1986 and you can hear the kind of ADD collage that Zorn would shortly pursue in the opening medley which, over 11 minutes, includes 14 pieces, among them "A Whiter Shade of Pale", "Misty", "To Sir with Love" and "The Shah Sleeps in Lee Harvey's Grave". His cover of Ochs' "When I'm Gone" is as stirring as his original, "Perverts on Northridge", is puerile. Lastly is his collaboration with members of The Violent Femmes, "Corpses of Foreign Wars". For my money, the best of the three, maybe not coincidentally the most rockish. Still mucho annoying in spots, sophomoric to the extreme, but the Ochs medley that closes the album (Outside a Small Circle of Friends/White Boots Marching in a Yellow Land/I'm Gonna Say It Now) is my single favorite Chadbourne performance in my very limited listening, very strong. Still, I gave up after this, around 1987. For good measure, let's include an entirely obscure piece of vinyl, one which I'm not surprised at all to be unable to find an image of, Jose Chalas' "Living on Avenue F", recorded in 1986-87 for Sunjump Records. Mid-80s, Lower East Side jazz rock, notable for containing one of Dave Douglas' earliest appearances on record (also features a group photo on the back showing Douglas resplendent in a full head of wavy hair, kinda funny). Jim Mussen, a drummer who worked a bunch with Elliott Sharp, is also on hand. Chalas plays guitar; the music isn't awful but is rather forgettable, a bit of electric Miles, funk, DX-7 sounds; almost coulda been a Laswell production. Don't think I ever heard of Chalas again. An unholy mess but, in large part, a goofily, sometime brilliantly enjoyable one. Fifty or so musicians, under Keith TIppett's direction, Fripp in the control room, splayed over two LPs, mostly in free jazz mode but with nods to rock and folk. Something of a Who's Who in London jazz and prog on those three days in June of 1971, although notably without anyone from the Bailey/Parker/Stevens (aside from Paul Rutherford) axis (much less AMM). But you have the South Africans Pukwana, Feza and Miller, a few Soft Machine-ites, Maggie Nichols, Julie Tippetts and many more. 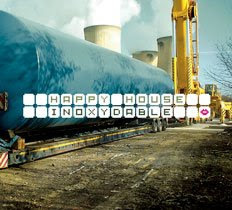 There's a lot of bluster, too much I suppose, but the piece trundles along gamely, pausing for some lovely moments like the vocal/violin/bass section at the close of Side One, as hippily pretty as you could want. The Pukwana/Stabbins feature on the rockish portion beginning Side Two is jaunty and fun then careens into a proto-metal riff that's just charming in its innocent strutting. The string of solos that follows is fine though unexceptional (Alan Skidmore's tenor run is rather strong and heartfelt) and the rhythm section slogs things down a bit, but the anthem that closes out the projects first half remains as stirring as ever. This is probably the point I began falling in love with Julie Tippetts. Things begin to fall apart somewhat on Sides Three and Four. 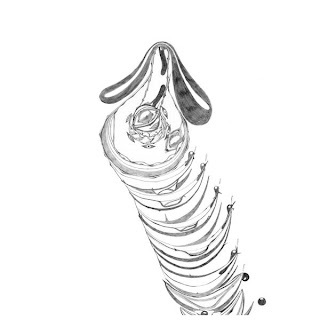 A march with an intriguing melody but Crimsonesquely plodding rhythm swells in volume to levels that engender murderous reactions in spouses but to no great effect other than loudness. A rather inchoate free section follows; not too bad but formless. Most of the last side is given over to a kind of Mingusian theme that segues into a lilting section that might work save for the three drummers stumbling over one another. Nice saxello work from the late Elton Dean. A chorus enters to chant the naive but inoffensive lyrics, perhaps leftover from some Peoples Liberation Music event. This section stumbles on for an ungodly length of time whilst (that's for Pinnell) the horns have at it way back in the mix. There's a fake fade-out then the vocals meander back in. It closes unexpectedly, and pretty nicely, with a duo of Charig and Tippett. Unwieldy as hell but with enough bright spots and an obvious abundance of enthusiasm to recommend it. Was thinking about Rackstraw Downes this afternoon. 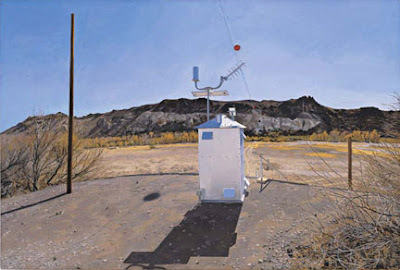 Don't know that I've mentioned him here before but he's a big favorite of mine among contemporary painters. Born in 1939 in England (where else would he come upon an incredible name like that? ), he began as an abstract-expressionist but in the mid 60s veered into a very idiosyncratic kind of realism. His paintings, both in reproduction and in life, often don't look like so much at first glance. Well enough done, but that's about it. Until you begin to see a couple of unique attributes. One is his use of multiple perspectives in a single scene. I wish there were better examples available on-line--if anyone knows, please fill me in--but often his landscapes have a wide enough aspect to require his point of view to change several times getting from the left to right edge. So you get a kind of arcing effect, including a bending of the horizon. It's something that hit home to me as I did similar experiments at Vassar, for instance doing a studio interior on a largish sheet of paper, beginning by drawing something on the far wall small enough that the top and bottom of the page would require that I look almost straight up and down. Very hard to accomplish and Downes, needless to say, pulls it off with far more subtlety than I. The other, not always in evidence, is that one can discern, by observing shadows in the painting, that there are several hours worth of observation in play, the vertical umbrae splaying out at different angles. This plus the fine sense of air he imbues, imparts a unique kind of life into his landscapes and cityscapes. 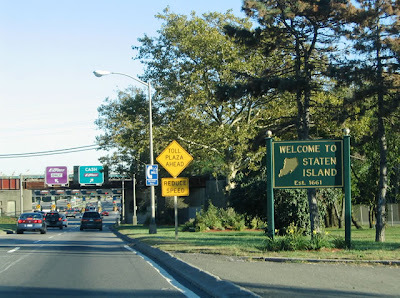 He did a few in Jersey City as well, at least one I can remember from underneath the Turnpike extension at Newark Ave., a great location indeed. 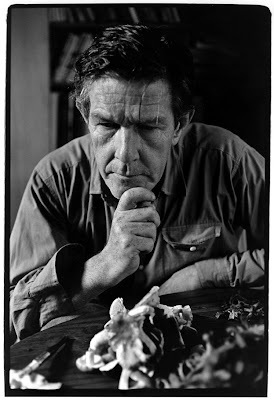 Last saw a show of his maybe two or three years ago in Chelsea which had a few striking works. Check him out if you get the chance.